There’s beer, is there hop? It’s not a secret that the success of a tasty beer is pure water, quality malt, full-flavored hop and caring hands of the brewer. If barley, which is successfully cultivated in Russia, can be replaced with corn, rice, wheat or other cereals hop cones are indispensable for brewing. Alpha acids in hop cones add bitterness to beer and essential oils provide specific flavor. Undoubtedly, this foamy drink is one of the most popular. Even those who are not consumers of beer are aware of this ancient drink. But have they ever wondered where hops are grown in our country, what varieties can be used for brewing and what the current condition of the industry is? Russia has been cultivating hops for ages. The concept of hop growing was introduced already in the 10th century. The hop gardens were mostly located in the Ukraine and such Soviet Republics as the Chuvash, the Mari, as well as in Kirov, Belgorod and Voronezh regions and the Altai Territory. In the second half of the 19th century in addition to national varieties of hops Bavarian, English and American varieties were cultivated. Hop gardens were located in Tver, Moscow, Ryazan, Vladimir and Kostroma regions, and in Chuvashia. The first mentioning of hops in Guslitsy (on the boarder of Tver and Moscow regions) is dated back to the 16th century. There people grew the variety called Guslyak which was successfully used in Russia as well as exported abroad. In 1976 the total area of hop gardens in the USSR was about 6 000 hectares and the harvest was about 2.2 tons per hectare. Hop gardening included a large number of varieties at that time. Less than 50 years ago one third of hops was grown at vast expanses of the Soviet Union. And this hop was highly valued in Russia and abroad. And now let’s look at what we currently have after all reforms and changes. 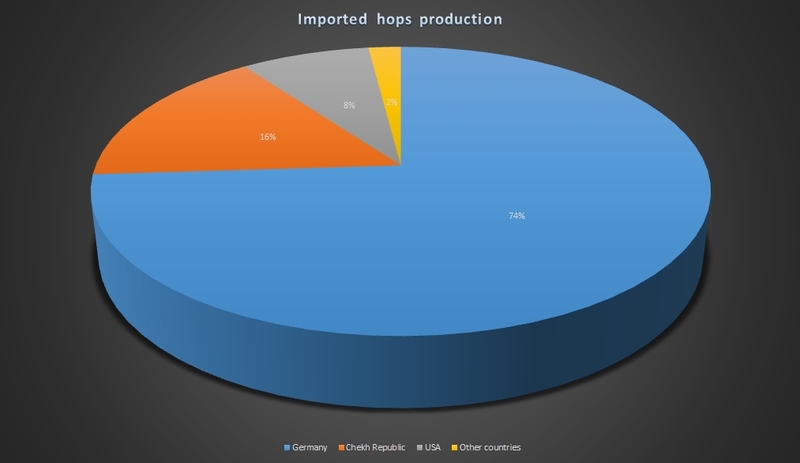 Unlike malt for which manufacturing large Russian and international companies successfully use barley grown in Russian regions as part of their own programs, hop is used mostly and, in the majority of cases, solely of foreign production. There are no international manufacturers represented in Russia and the processing industry is close to none. The current area used for hop gardens in Chuvashia is incomparable with what it used to be before, not to mention the diversity of hops and technical equipment. 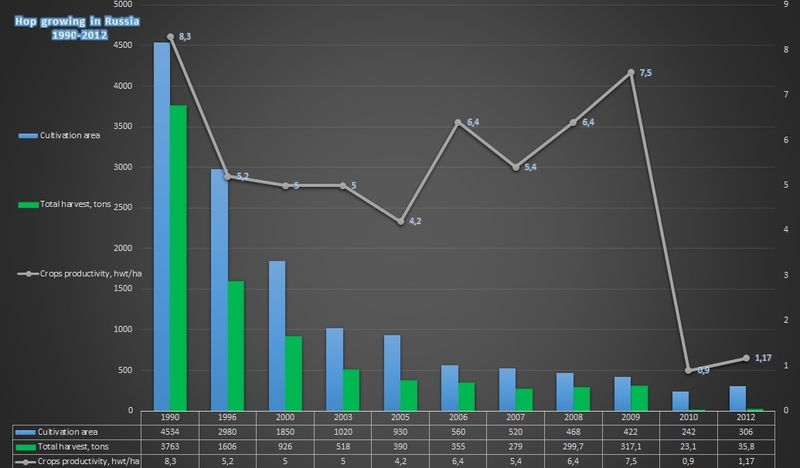 Today the main producers of hops are the Chuvash Republic with 82%, the Mari El Republic with 6,5% and the Altai Territory with 3,3%. Only in 2013 Russia imported hop for the sum of $ 23 805 506,73. The great shortage of Russian hop production, the lack of hop diversity, the rise of dollar rate and the focus on import substitution, the potential and the vast expanses of our land - all this have given us an impulse and encouraged us to revive the national hop growing. We believe our hops will be able to become a worthy alternative to the imported ones, and the choice of the varieties to produce will encourage having new vision of this industry development. Presently “Razdolie” company launches a new exceptional experimental project. This spring we are planning to plant hop rhizomes at our test area. The test will include 13 varieties, 11 of which are foreign ones. LLC Razdol'ye © 2017 All rights reserved.